I should probably begin this review by informing you that I have not watched a whole lot of Stargate: SG-1 or Stargate: Atlantis. Oh, I've sat down in front of a few episodes of each series. But I concluded on these occasions that the popular franchise just wasn't my cup of tea. Not that the shows were poorly-done in any particular sense, only that they weren't my thing. Admittedly, this is my bias: I tend to prefer my space adventures in one of two modes: first, in the anti-establishment vein of Firefly, Farscape, Blake's 7 or even Doctor Who. Or second, I really dig space adventures in which the characters are cut off from the establishment (from Earth, actually...), dealing with the mysteries of the galaxy without an available command structure or back-up reserves. In this light, I think of Space: 1999 or even the original Star Trek. In those programs, life and death is on the line with every last decision. There's no cavalry, for the most part, to come over the hill at the last moment. What little I viewed of the Stargate franchise seemed to me both over-militarized and under-serious. That may or not be a fair critical statement. It's a personal impression based on my narrow experience with the Stargate panoply. But I have a good friend and regular reader here on the blog, Pete, who suggested that I check out SGU: Stargate Universe, the latest arm of the franchise, airing on Sy Fy. Long story short: I'm glad he recommended it to me, because, unlike the other examples of Stargate, this incarnation is indeed right up my alley. Also, the re-imagined Battlestar Galactica series was alarmingly lazy about creating the universe around its human characters. On alien planets half-way across the universe, people drove late 20th century, American-produced Humvees. This was basically an admission on the part of the producers that television can't believably do "sci fi" -- a theorem I disagree vehemently with -- and so no real imagination was afforded for the look or design of the show; to create believable alien vistas, technology or cultures. The only civilizations in all of Battlestar Galactica were humans and their creation, the human-looking Cylons. Terrific analysis of the series and while you nail your observations, I still find myself somewhat bored by it. I think the Space:1999 parallel is completely fair. There is even a mood about it that reminds me of the wonderful Sunshine, but thus far I haven't been overly interested. And John, I completely agree with your assessment of the human conundrums that are faced. This is an entirely different SG universe from Atlantis and SG-1, but, unlike yourself, the characters haven't grabbed me at all. I like Rush and Young, but I'm still not concerned about any of them. I do feel you sumed up Battlestar nicely as well. I liked it for the reasons mentioned, but in the final analysis felt fairly underwhelmed as it went forward. Perhaps the opposite will hold true for me with SGU, my initial reaction has been disappointment, but it can certainly change going forward. I'm open to the possibility. You point out many reasons why I should like SGU quite accurately, but it has yet to take hold. Maybe I need to give it another chance. Farscape is wonderful. That's my kind of series when it comes to breaking with convention. I also love Farscape (and will be doing a flashback of it here soon...), and agree that SGU is not in that class. I can understand what you mean about the characters. I was a little thrown by Rush's behavior in "Darkness" until caffeine withdrawal symptoms came into the picture (!). I've only watched "Air" (all three parts), "Darkness" and "Light" so far, but the second disc of episodes arrived today and I am looking forward to the next batch. Now, I may very well find myself where you are right now - my enthusiasm waning. But so far I've felt interested enough to wanted to stay tuned in, and that's a "new" feeling for me regarding contemporary space adventures (especially ones with the word "Stargate" in the title)...so I guess I'm enjoying it. I havn't seen any of Stargate Universe yet, and after your review I think I'll check it out. I remember watching a decent amount of SG-1 back in the day. It think it is fair to say that SG-1 relied too much on Erich von Däniken's concepts and plots that wern't always the most inventive. And having watched season 1 on DVD a year or two ago some of the SFX havn't aged well. All of that said, I always found the characters to be likeable. It's been a while but I didn't find the series overly militaristic. The characters were all in the military, of course, but not necessarily warmongers. Daniel Jackson (Michael Shanks) was an archaeologist and Teal'c (Christopher Judge) was a Jaffa. Richard Dean Anderson was likeable as the sarcastic leader, and Don S. Davis brought the experience of having actually been an officer in the U.S. military. Most interesting is the character of Samantha Carter, played by Amanda Tapping. Here we have a woman in an elite U.S. military team that goes into combat. Let's compare her to female-Starbuck in the reimagined Battlestar Galactica. Samantha Carter has a Ph.D. and is a soldier. Starbuck is a great warrior, sure, but one who isn't above punching a superior in the face. In this view Stargate SG-1 presents a more feminist character: one with brains and braun. A professional through and through. Even though I watched SG-1 quite a bit, I eventually drifted away from the series and have not seen the later seasons. Nor have I seen Atlantis. And make no mistake, I'm not saying SG-1 is one of the best SF series to ever grace the airwaves. But it certainly isn't the worst, either. 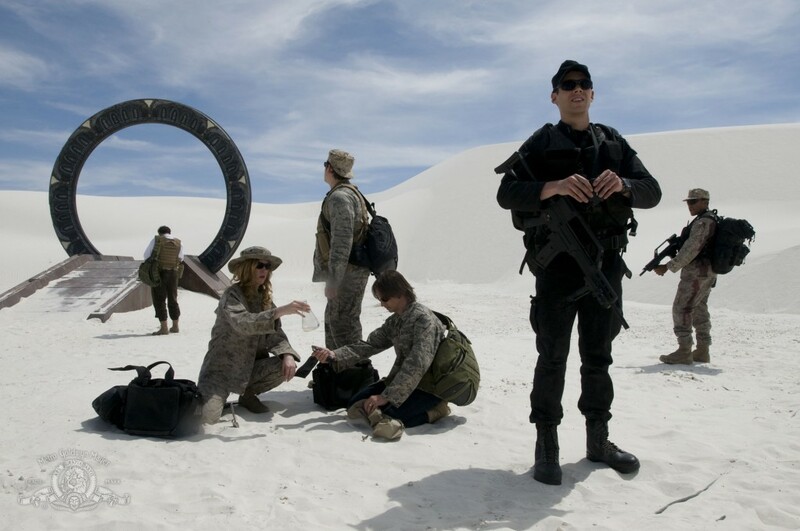 I don't have any hate in my heart for Stargate SG-1...it just wasn't/isn't my cup of tea, at least until this later incarnation(SGU) got me interested in the "universe". In terms of the military presence in the show: just the costumes and ubiquitous presence of guns ...on a personal level I didn't groove on it. Now I respect and admire the military in real life, but I tend not to like sci-fi in which the military is at the center of the action. Again, that's my bias...I'm not saying it's an objective "bad" thing. 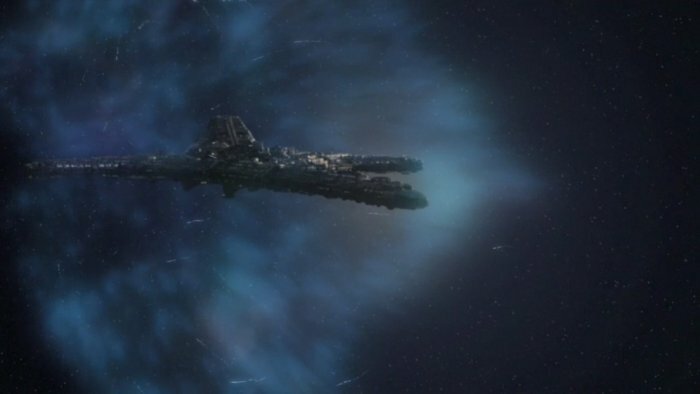 I should probably watch more SG-1 and Atlantis, and if anything, SGU has gotten me more intrigued in a universe I have only a narrow experience/acquaintance with. I do recall that the episodes I watched some years back had almost a campy quality too; but I can't tell (from my memory...) if that was just my perception, or really how it was. I'm curious. You are no doubt correct about Samantha Carter. I understand that both the character and the actress are widely admired, and I think that's great. I do like SGU at this stage. I'm intrigued enough to want to know more. Stargate SG-1 has been around so long I'm kind of intimidated about "picking it up" when it means like ten years of episodes...and I'm not sure how good they are, you know? I never really thought of "already had everything they needed to succeed, whereas Space: 1999 adopted the perspective that the characters did not already have what they needed to survive." I think this is apt, and an interesting explanatory mechanism through which these shows can be viewed. Indeed, while I liked BSG more than you, I was also bothered by it's ridiculous and uncreative similarity to Earth (but yet they cut the edges off of their papers??). On a related note, I remember when ST Voyager went to the Delta Quadrant and met people who were eating with forks. I was stunned by this lack of creativity on the part of the authors. SGU suffers from no such lack of thoughtfulness. (And while it would be unfair to retroactively criticize the makeup team of any of the Treks, we now have the technology to make the aliens non-humanoids, which, although briefly, SGU has used very well). One thing I'd like to add to your review is that the interactions between crew members are not saccharine. Like Babylon 5 and (again) unlike Trek, there are alliances, rivalries, and even brewing hatreds. This adds an interesting layer of conflict to an already tense and haggard crew. But it's the little things that make this show wonderful and add to its real life, dramatic flavor. The caffeine/coffee withdrawal, the sewing of one's socks (take that, Trek! ), the inclusion of some real life events without being overly conspicuous (the first time I saw this was in Farscape, final season, and it was also very well done), the pettiness, etc. 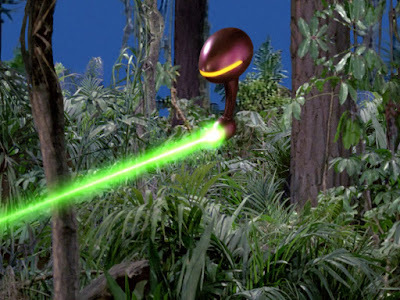 In many ways, this show could only have come about in a post-BSG universe. It's the culmination of, and improvement upon, much of the sci fi that has come before it. Thoughtful sci fi fans were sick of formulaic drivel, epitomized by ST Voyager, and we wanted to get back to thoughtful adventure (think Blake's 7 at its most meandering and least ideological). I'm really delighted that you enjoyed the show. I'm looking forward to more penetrating reviews. You did me a real service recommending SGU to me. It is a very good show, and I'm looking forward to picking up on some of the other details you note here. I think you are quite right to note that SGU looks to have learned the lessons of many other programs (from BSG to Voyager, to yes, even Space:1999). The result is a show that, at this stage, I find pleasing and compelling. You've really intrigued me with this flashback, John. For some reason (perhaps it was the small screen casts), I never got into the multiple SG TV series. I loved the '94 Stargate film they were based on, though. With James Spader and Kurt Russell leading a solid, if quirky, cast, I so enjoyed it . And, all of it happening before Roland Emmerich started going off in sorts of directions (your 2012 review covered that well). The premise for this, however, does make me curious. Your Star Trek and the second iteration Batttlestar Galactica analysis is always insightful. I found the longer I stayed with BSG (and their characters playing off their weaknesses as opposed ST's cast working off their strengths), the less I cared about them. That and the fact the universe only seemed to have "humans and their creation, the human-looking Cylons." to follow (as you accurately put it). Still, this series may keep my interest. Thanks much for this, John. I am pleasantly surprised to read your review of Stargate Universe. You get it, and it makes me very happy! Thank you for taking the time to watch the show, and for writing this. Much respect for you! Sherry Harris (Brian J Smith's mom) ! Some very good comments here about SGU. Stargate: Atlantis is still my favorite of the franchise (haven't seen much of SG-1) but SGU has been the highlight of my Fridays for the past year or so. I think it handles character drama and development much better than SGA, but I wish they would get around to answering some of the questions they pose and meeting some aliens as well. The second half of season 1 has really picked up steam, and I'm looking foward to season 2. BTW, if you like sci-fi shows were people are cut off from Earth, Stargate: Atlantis did this very well in its first season, though ended up making contact (and to my mind, taking some of the drama out of the show) in season 2. Just a quick thank you for helping me cogitate on this show from a different angle than I had previously. Hi everyone, thanks for writing. Le0pard13: SGU is really good, and the episodes keep getting better. In my opinion, this is the best new space adventure since Firefly. I think you'll end up really getting into it. Malibunextyear: Thank you for your kind words. Your son plays Matt Scott on the show? Wow. That's very cool. One thing I didn't mention in my review but which I also admire about SGU is that Scott's character is treated in such non-cliched, non-conventional fashion. He's a young military man with a tragic past (and a history that almost led him to the priesthood). Brian Smith doesn't play him --- and the writers don't write him -- however, as cocky or like a stereotypical "grunt." Instead, the performance and the writing seem to convey a wisdom beyond his young years. Scott is one of my favorite characters so far. Frusty: My pleasure! Thanks for stopping by. One of the most interesting SGU reviews I've read! Thanks for taking the time to write it out. It's always good to see what someone who 'gets' it things.